I decided to do some spring cleaning in the shed this weekend. The place was a real mess, and needed a good tidying. I managed to get rid of 4 massive bags of shavings, off cuts, beer cans, packaging, old paint brushes…. etc. etc. Don’t think I’m stupid enough to drink alcohol while operating machinery or using tools. The beer is from wind-down sessions after the working day ends. I have been prepping some bowl blanks too, from the various timber types I have lying around. I have been asked to produce a couple of display mortar & pestle sets, so have turned a few spalted cherry pestles and rough turned the mortars from very wet birch. The mortars have been stuffed with wet shavings and wrapped in brown bags for finishing later if they don’t crack. I have quite a lot of cherry from last year’s pruning which has dried quite well. Cherry is renowned for splitting if you look at it the wrong way, but this load seems to have cracked in fairly large pieces. 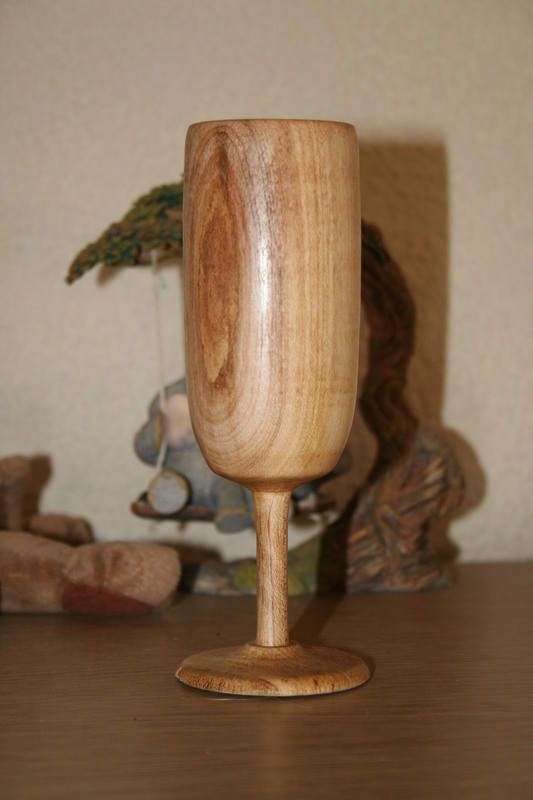 I turned a little champagne flute from one of the smaller bits, and finished with shellac and beeswax. Lastly, I made a load of spalted beech pen blanks with some of the nicest grain I have seen in a while. 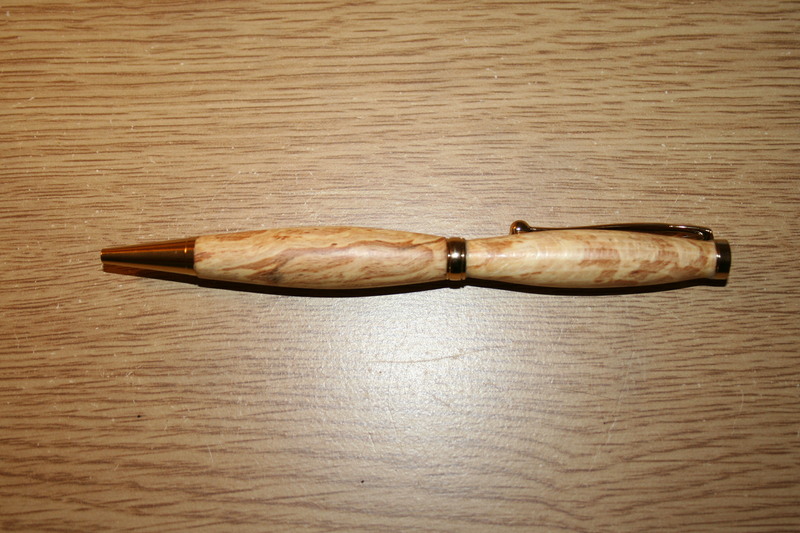 I turned a pen from a sample today, just to see how the finish would look. The finish is boiled linseed oil & superglue with a natural beeswax over the top. The pen shape is made for my hands, so I am able to grip it properly. This will be my new pen for work. This entry was posted in Beech, cherry, Idiot Inside, Pen, spalted beech, Turned Pen, Turning, Wood Pen, Woodturning and tagged beech, Champagne Flute, cherry, chuck, goblet, Pen Blank, Spalted Beech, Turned Pen, Turning, Wood, Wood Lathe, Wood Pen, Woodturning. Bookmark the permalink.